There is something timelessly magical about a top hat. In 2008 I was introduced to a top hat that a stylist had randomly brought along last minute to a TV show we were filming. When I laid eyes on that thing I was truly smitten. I'd lost my long time relationship earlier that year and seeing that hat was like having a dashing gentleman character offer his arm or ask me to dance. Somehow like a boyfriend! To wear it was to have a partner. I was forced by my fervor to ask the hat maker (haberdasher Gunner Fox) make me a similar hat. When my new pal arrived I felt less lonely and somehow more tuned into the way such a classic hat could put a whole whimsical spin on the history of people's sorrows. I often draw power from wearing my custom top hat and brought it out again to help me recharge for the upcoming Hollywood Bowl shows. We were all pretty nervous since we'd never played The Bowl let alone played with a full orchestra! 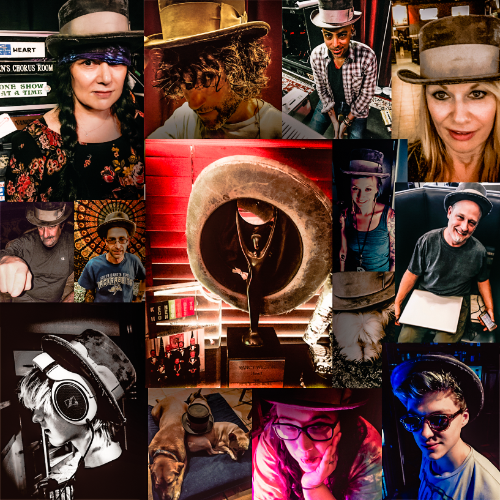 I took a series pictures (still ongoing) of Hearts band family and crew gathering strength from the hat. Each person suddenly became a character from all times. Quite fascinating. Something about it worked well since both shows with the Hollywood Bowl Orchestra were such amazing and beautiful nights. Now I'm still traveling on tour with the magic top hat. When I get back in a few days the hat can take a well deserved break on top of my good old piano where it will be returned to its favorite hanging spot. Right there on the Rock and Roll Hall of Fame award!